Lavender and Frankincense essential oil are my top two all-purpose essential oils for the body. I love adding a few drops of Lavender to my Epsom salt bath or adding a drop to some coconut oil to kick my moisturizer up a notch. A drop of Frankincense is wonderful as perfume and amazing for skin health! Just make sure you choose a reputable brand. To use just sprinkle a little bit in your hands and rub together. Then massage into your roots and finish with a hair dryer if needed. Epsom salts can feel like a miracle in a bag when you need a little help relaxing. A few cups added to warm bath can serve many purposes all-in-one! Not only is it incredibly relaxing, but it’s also a great way to get a transdermal source of magnesium, and can help ease you into going to bed early. Simply add 1-4 cups of Epsom salt to a bath. If you’re new to Epsom salt soaks, you might want to start off with a cup and increase by a little bit each bath. Since Epsom salt baths can make you a little on the drowsy side, they are best done before bed until you’re familiar with your body’s reaction. 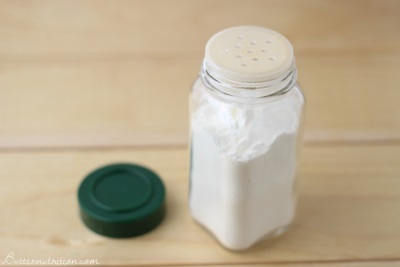 I actually prefer using magnesium chloride flakes to make a magnesium spray over using Epsom salts, as it’s a more absorbable form through the skin, but it tends to be a little pricier and more difficult to find. Baking soda is a must in ANY bathroom. From cleaning to soaking, to occasional teeth polishing, it’s an inexpensive multi-purpose item that can save time and money. I’m going to take a wild guess that if you’re a female then you’re familiar with what a urinary tract infection (UTI) is, from either having one yourself or recalling a friend suffering in misery. That’s why I LOVE these test strips that can help you detect one early in the comfort of your own home. They are especially helpful for anyone with painful bladder syndrome (also called interstitial cystitis or IC) that can actually mimic symptoms of a urinary tract infection without actually having one! This particular test looks for leukocytes (white blood cells) and nitrites in urine to indicate signs of infection. There are also some more advanced test trips, but they are a little harder to understand, so they are probably not the best choice your first time around. Tampons and pads should be things from the past, since they carry health risks. If you haven’t given the menstrual cup a try– there is no greater time than the present :). Keep in mind that they do come in different sizes, usually one for pre-birth and one for post birth. If you’re connected to the internet, my guess is that you already know about coconut oil for use as a body moisturizer, makeup remover, and for oil pulling. But what about clean face oils like olive oil, Jojoba oil and my personal favorite Calendula oil for oil cleansing and facial moisturizing? Once you start using face oils, you may never go back to using a traditional moisturizer! Washing your hair every day is a big no-no for hair health. If you prefer showering instead of taking a bath, a shower cap can come in handy! These things are the best thing ever for achieving soft skin and they are so inexpensive. Not only can they help prevent ingrown hairs, but they are fabulous for exfoliating all parts of the body! I love using them every 1-2 weeks to help remove dead skins cells, but be careful not to exfoliate too often or you can irritate your skin! This one product can have so many purposes. From making your own DIY hand soap, adding a tiny bit to the bath, or even using it to clean your tub, toilet, sink, and counter (with a little baking soda), it comes in super handy. It’s also ultra-concentrated, so a little bit goes a LONG ways in your natural product arsenal.